It has definitely been a slow start to the new year. Or maybe I should clarify by saying I have been slow to start the new year. I am not quite ready to take on the list of ambitious projects and goals I have. I would rather play – play with our new kittens, play with my camera, play with friends – anything but do something that might resemble real work with real deadlines. 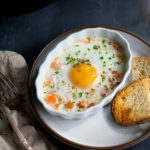 So, staying in line with my “let’s put off real work” attitude and embracing the “life’s too short to not enjoy the ride” sentiment, I present you the perfect recipe for when you want to have a nice breakfast but want to keep it simple – baked eggs with smoked salmon and chives. Don’t let the name fool you – it only sounds complicated. In reality, the prep is minimal. Chop 2 items, butter some ramekins, crack some eggs, drizzle some cream. Then bake and eat. And, of course, you should invite some friends over because these baked eggs with smoked salmon will taste even better when you enjoy them with those you love and can linger over an extra cup of tea (or two). Generously butter 4 small, shallow ovenproof baking dishes or ramekins. Divide the smoked salmon among the baking dishes. Use the back of a spoon to make a small indentation in the salmon at the center of each dish. Crack an egg into each indentation. Sprinkle each dish with chopped chives and pepper, then drizzle 1 tablespoon of cream on top of each dish. Place the baking dishes on a rimmed baking sheet or roasting pan and add enough hot water to come halfway up the sides of the dishes. Bake for 10 to 15 minutes, or until the eggs have just set. Remove from the oven. Transfer the ramekins to serving dishes using a slotted spatula. Serve with warm toast. This sounds so good and I love the shadow in the background of this photo. So pretty! I love your work!